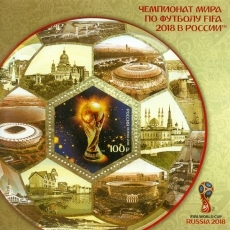 On 14 June 2018 Russia released a souvenir sheet commemorating the World Cup held in that country this year. In the lower left margin of the soccer ball we can see the decorative lighthouse in the Kaliningrad Fishing Village on the banks of the Pregolya River. This lighthouse serves no useful purpose for navigation but looks good in the shopping and dining area of the city. This entry was posted in Lighthouses and tagged Russia. Bookmark the permalink.